Despite the snow, the rather slick roads and the seriously crazy drivers, I made it over to my friend, Heather's, for a Panera lunch and some fun crafting time. 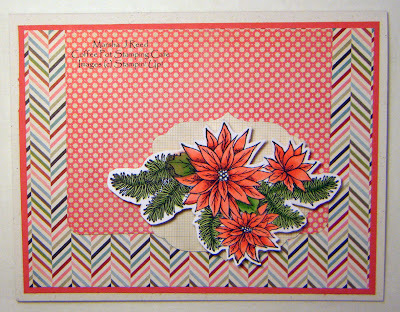 It was a real treat for me as I have been wanting to use some of her My Favorite Things stamps and dies since I don't have any, yet. 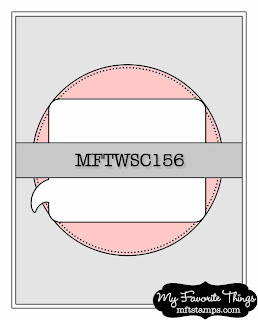 We played along with this week's MFTWSC sketch and this is the card I made. My oldest grandson, Rodney, has a birthday next month and this was a perfect sketch to use for his card. The dies used were MFT Die-namics Stacking Stars and Die-namics Blueprints1. I don't remember the name of the stamp set that the happy birthday came from but I love the cursive. Now here's the sketch from the MFT blog. It was such a good day! I am looking forward to the next time Heather and I get together. Thanks for stopping in at the Coffee Pot Stamping Cafe. 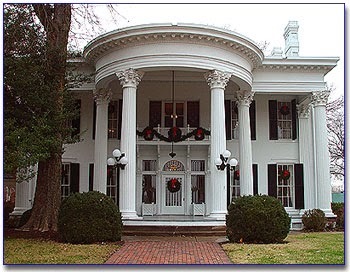 May you have a safe and wonderful Christmas. This week has been a wild one! 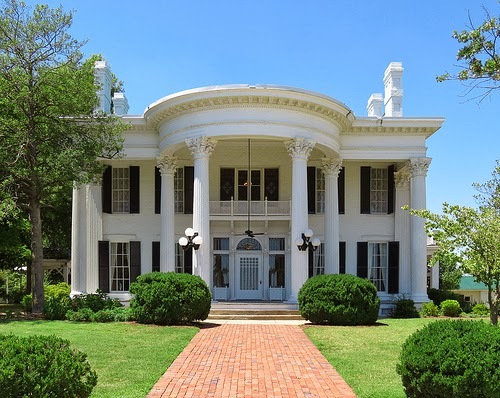 Tuesday and Wednesday was spent on the road with my oldest son making a fast trip to Tennessee and back. Consequently, that did not give me much time for creating and crafting. I've spent Thursday and Friday recuperating! It was an enjoyable ride and the best part was getting to spend so much time with my son. Today I'm sharing a very cool stop we made on both days. 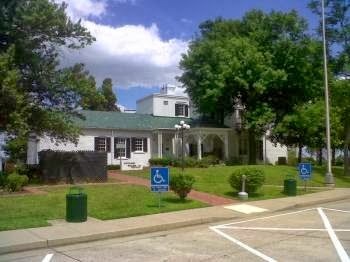 It's a fantastic rest stop found in Paducah, Kentucky. We didn't have time for the tour, which I would have loved. I tell you it is the cleanest and best rest stop I've ever seen. Unfortunately, I didn't take a picture myself. Yes, it was planned for the Wednesday and we took off before I remembered I wanted the picture. I think my brain was in melt down by then. Anyway, here are a few pictures I found to share and if you click on the top two photos, you'll go to websites that give a bit of the history of Whitehaven. We actually saw it at night on Tuesday with the Christmas decorations and it was beautiful all lit up! Monday should see me back on a more normal schedule and I do have plenty of creating time set up for next week. 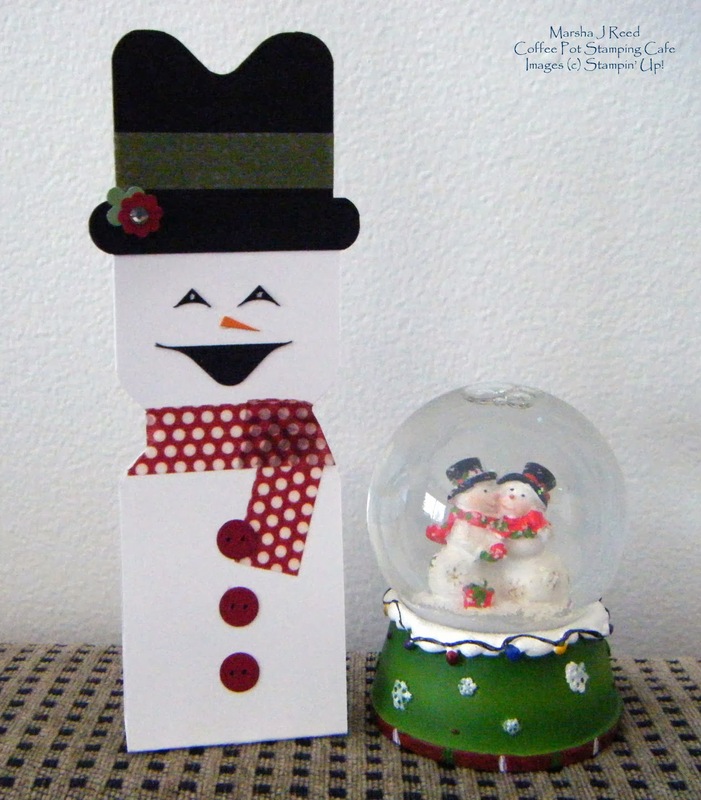 I have Christmas cards to make and send as well as gifts to get finished. Such a busy time! I will lift up my eyes to the mountains; From where shall my help come? My help comes from the Lord, Who made heaven and earth. Plaid is one of my favorite designs but I never would have thought of stamping in plaid. 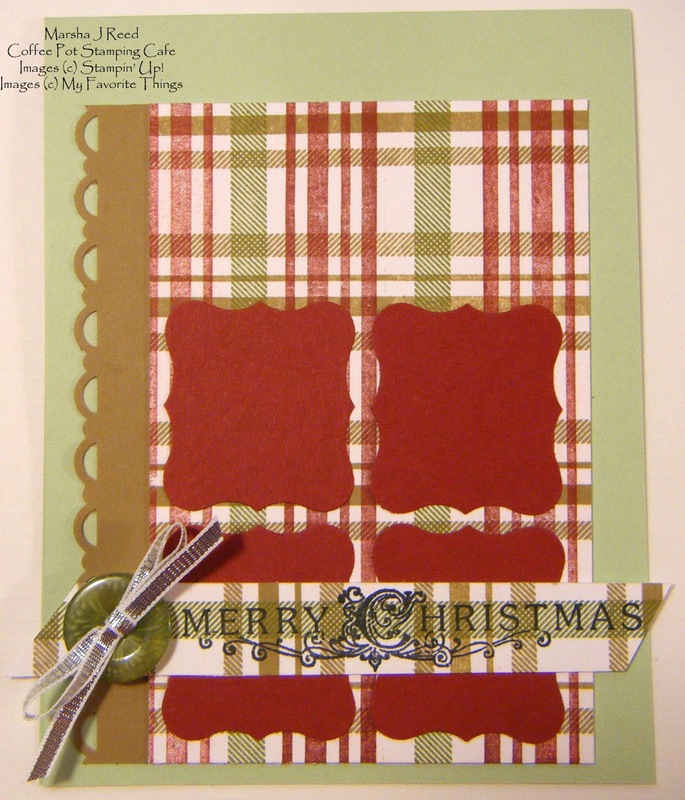 A combination of old colors, Cherry Cobbler and Old Olive along with new color, Baked Brown Sugar and Pistachio Pudding were used to make this pretty Christmas plaid. Since I used the sketch from My Favorite Things, I decided to play along with this week's challenge. If you'd like to join, you can click HERE or on the image below to go find out all you need to know to play along. And, I also entered the make your own background challenge at Simon Says Wednesday Challenge. Another Stamp Club favorite is this clean and simple card with just a touch of sparkle. 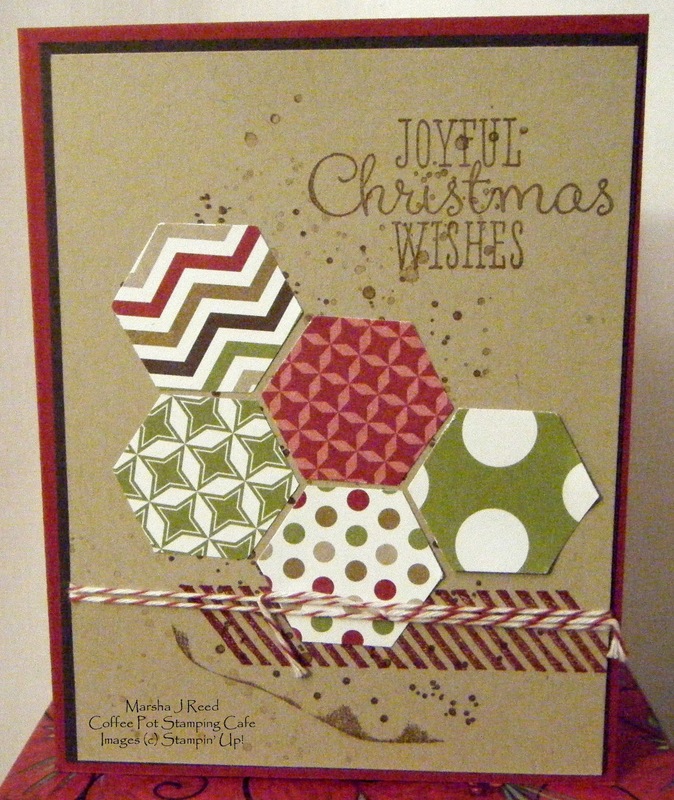 Season of Style Designer Washi Tape, the new Mosaic Punch, a circle punch, some 1/8" Silver Ribbon, twine and a stamp and you have the makings of a very cool Christmas card. 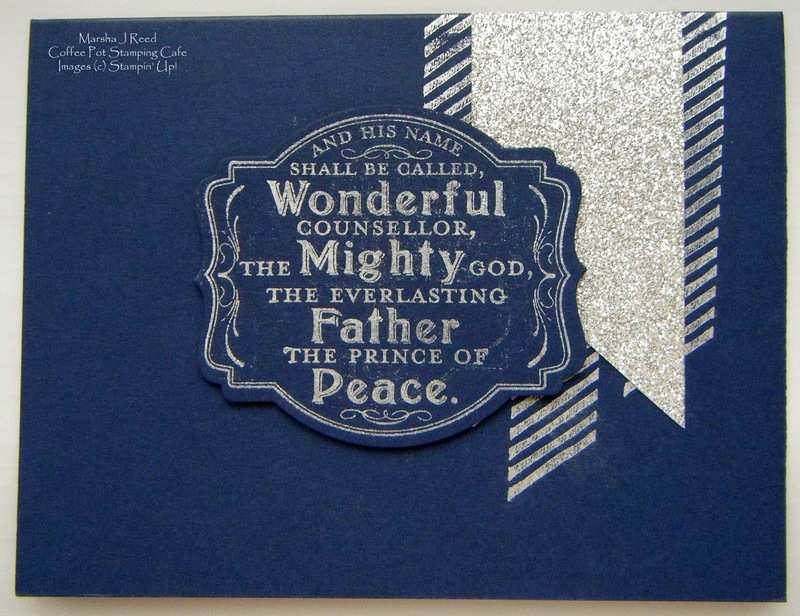 And don't you just love that Silver Glimmer Paper! It comes in Red and Champagne, too. 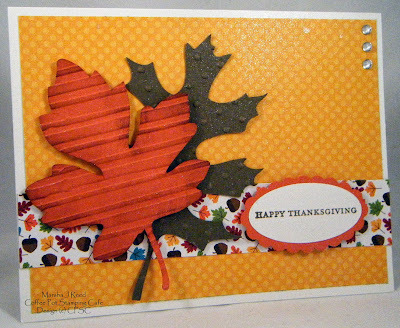 Since my upline, Andrea, designed this card, I don't remember what stamp set was used. I've looked and looked in the catalogs for it and have had no luck finding it. Of course, your favorite Christmas sentiment would work as well. Yesterday afternoon was spent crafting with my friend, Heather. I really enjoy the time I spend with her and I always learn something new whenever we get together. After she had stamped some plaid backgrounds from the new 2013-2015 In Colors, she designed a beautiful Christmas card for me. 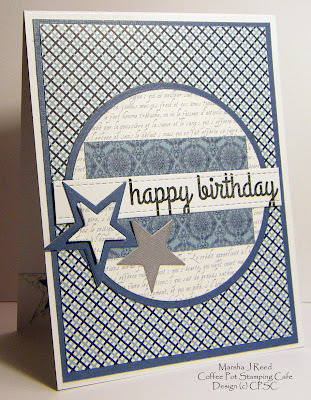 I love how she combines the different patterned papers. She used three different ones on this card alone. She does a fantastic job of fussy cutting, too! 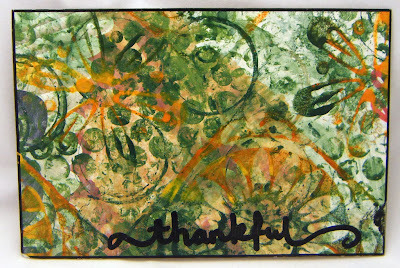 I had such a great day and look forward to crafting with Heather again soon. 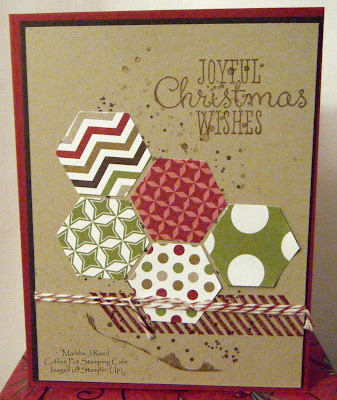 Tomorrow I'll share one of the cards I made using one of the plaid backgrounds Heather stamped for me. They are so cool! It is with some sadness that I must say goodbye but it will be for just a short while. I am moving and tomorrow the Internet will be shut down until I get into my new place. 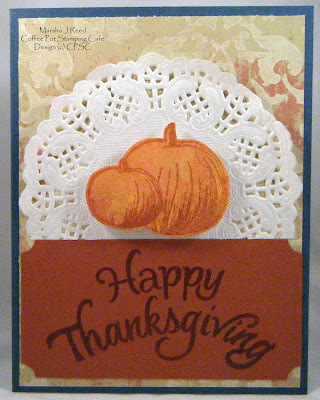 It will be too many days before I even find my craft supplies again and can make some new projects to share with you. 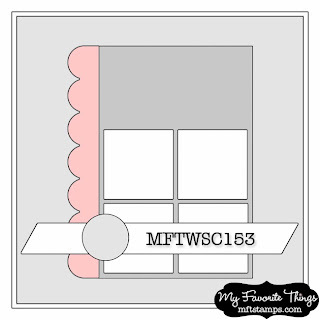 In the meantime, if you have any questions about placing a Stampin' Up! order or scheduling a Workshop, just send me an e-mail and I'll answer back within 24 hours. 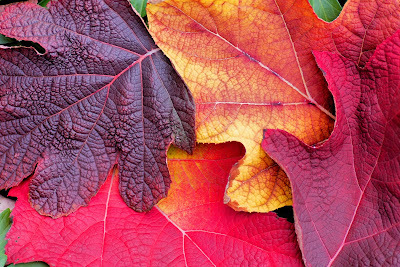 For now, enjoy some pretty Autumn colors. I'll be back soon. It's hard to believe that my next to the youngest grandson is seven today. Where has the time gone? Nic and his brother Zac spent the morning with me and made bottle cap necklaces. They were fascinated by the melting embossing powder. I have to admit it is fun to watch. 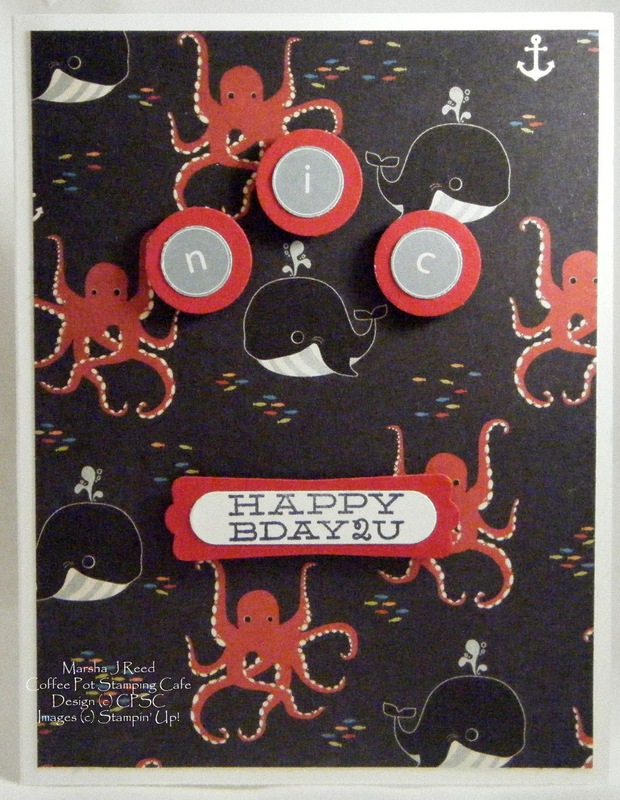 I kept Nic's birthday card very clean and simple. Being a boy, he just is not into being careful. :-) You just gotta love him! 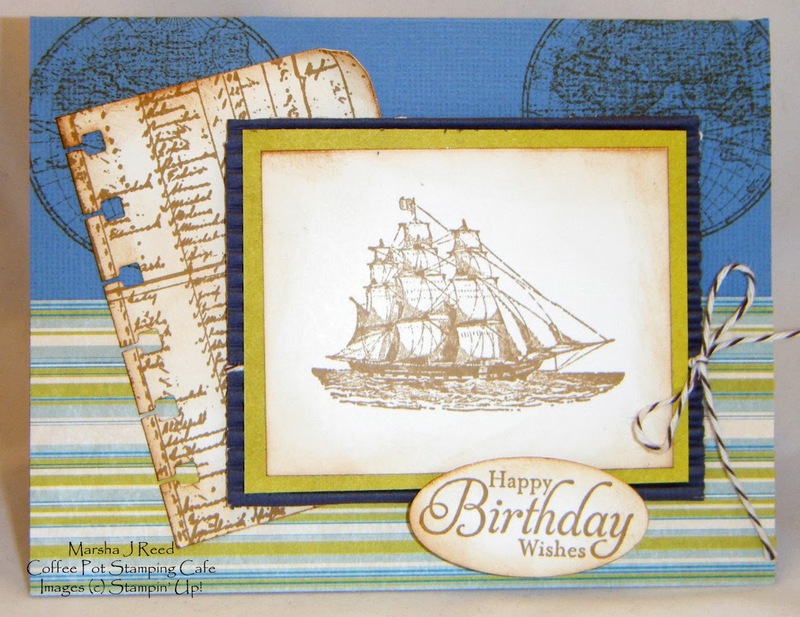 The patterned paper is from Fancy Pants Down by the Shore paper pad. I love those little whales! Over the next few weeks my time to create is going to be very limited. I'm going to try to post a couple of times a week but that may not happen. Sigh... I'm moving and I've kept only a few of my craft supplies out just so I can get my fingers in the ink once in a while until I'm moved and unpacked again. The boxes are being packed and the stacks are growing in my living room. I try to do one room at a time but that just never seems to happen. I get a box so full then it's time to add some light weight things to finish it up which, of course, are always in another room. It's a never ending battle. 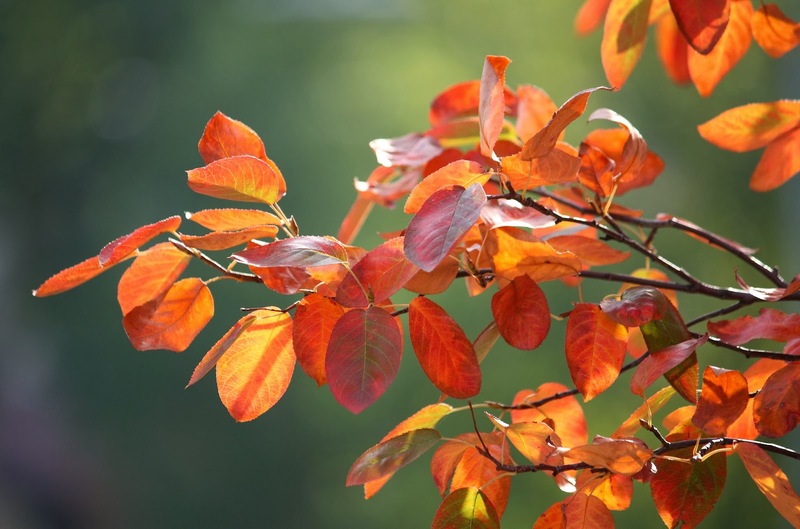 To top it all off, the leaves are changing and the days are very cool, in the 50s. There is going to be no time to take a drive and enjoy the beauty. Hmm? I'm headed to my grandson's birthday party on Saturday. I may just leave early and take the long way just to soak in some of the color. Whosoever shall give drink unto one of these little ones a cup of cold water . . . he shall in no wise lose his reward. You know, you can never have too many birthday cards. There is just one problem, the birthdays I have coming up in the next couple of months are for my sons and grandsons. Guess I need to get busy with some guy designs. For now, here is my latest gal card. 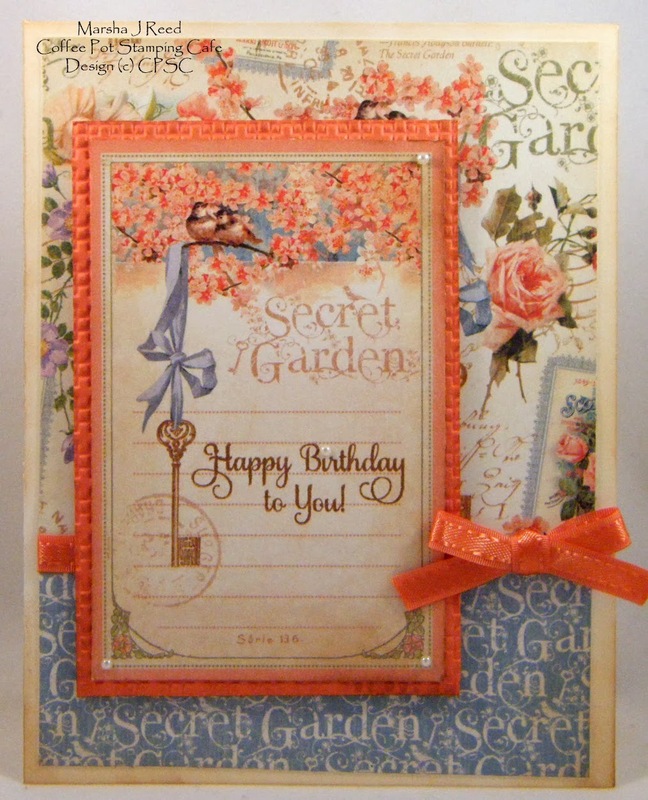 I used more of my Graphic 45 Secret Garden patterned paper and I love how the coral and blue come together. I've used this design before and really like the way it looks. I think it would be pretty as a Christmas Card. I may just have to give that a try. Yes, it is possible to make a card without stamping an image or sentiment. Will wonders never cease! I know it's way to early for Valentine's Day but I was in the mood for something simple and different. This sweet little design fit the bill perfectly. It is not often I use pink so my friend, Heather, should be so pleased. 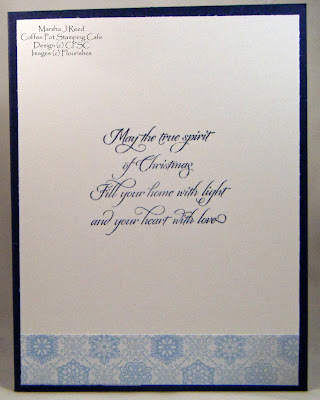 The sentiment was printed using an Inkssentials White Opaque Pen. 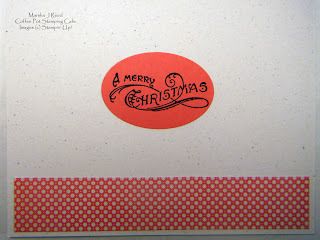 For the card base I used Pink Pirouette and Rose Red card stock from Stampin' Up! 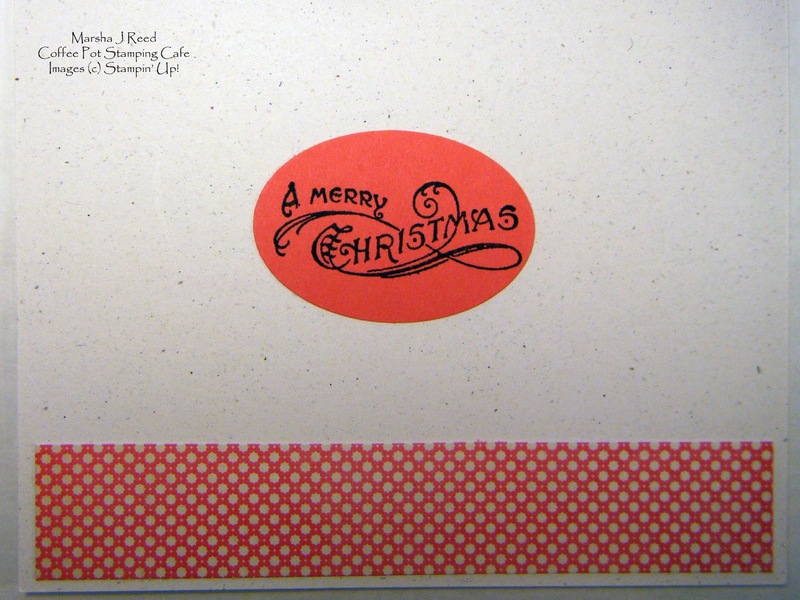 The patterned paper is from Jillibean-Soup's Grandma's Lima Bean Soup. 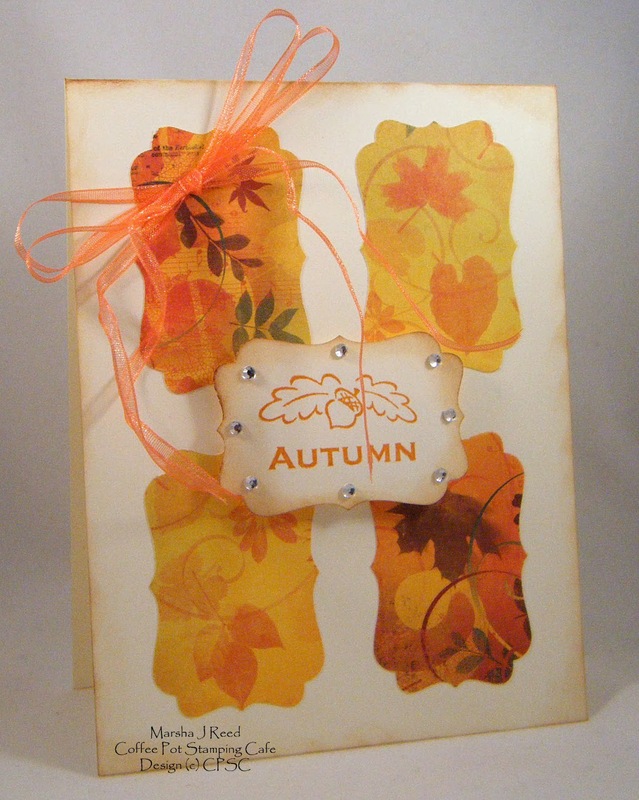 Punches, dies, twine, eyelets and rhinestones finish it off. 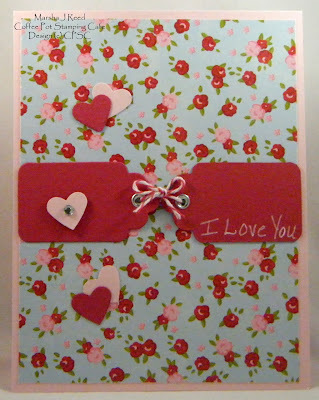 The inside has a strip of the patterned paper with a Pink Pirouette heart attached to it. Hello everyone. 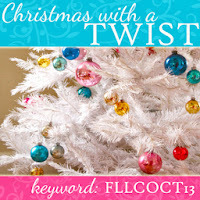 It's time for you to vote for your People's Choice Guest Designer over at Flourishes. They had a contest for their December Guest Designer spots and I decided to play along. Now it's your turn to help that dream come true. Click the link above or the image below to go to the voting booth! You have until October 14th at 11:59pm CST to cast your vote. 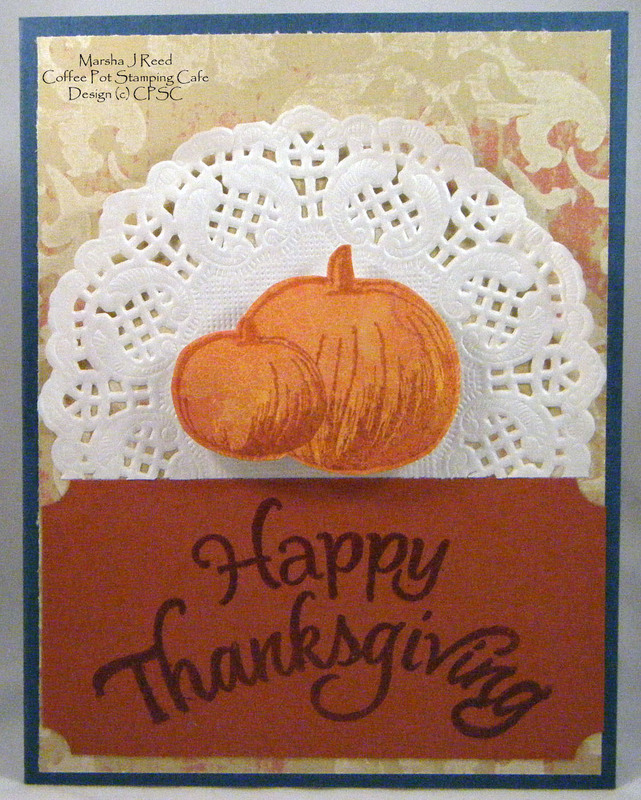 Here is the card I submitted for the contest. A bow and a new sketch. 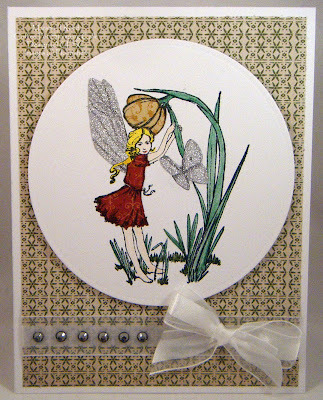 Today I used the sketch from Freshly Made Sketches to create this card for the Crazy 4 Challenges Bows Challenge. Whew! Can you tell I love challenges? 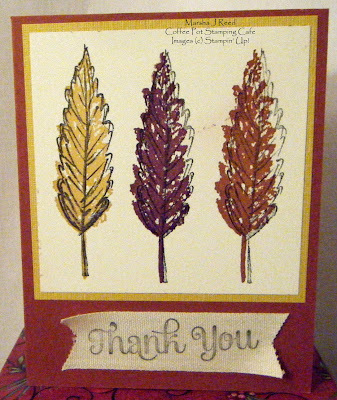 And, sketches make it so easy to put a card together. To find out more about the sketch and challenge I used today, just click on the links above. 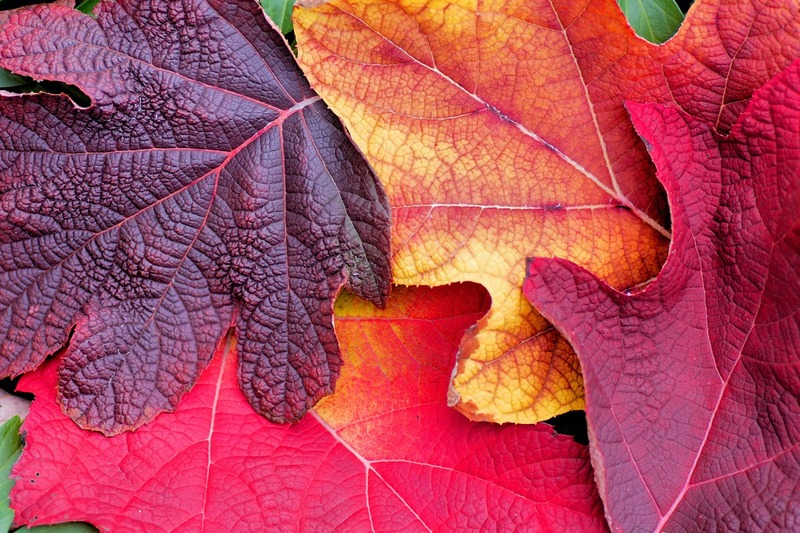 I love Autumn! Can you tell? 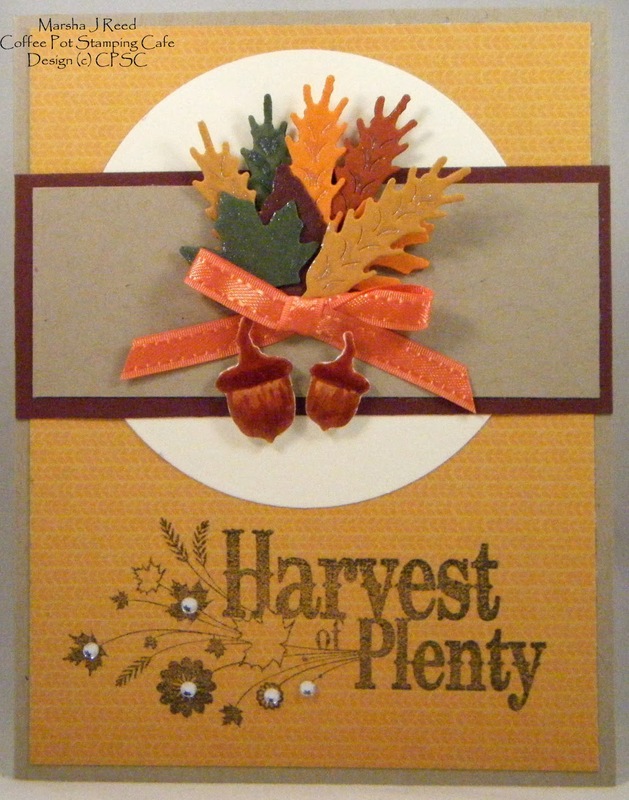 I've been making a lot of fall cards. Now, I'm off to make a birthday card for my oldest son, Wayne. His birthday is Saturday and we are getting together for some cake and ice cream. It's another Timeless Tuesday Challenge and this one was so much fun! One of the requirements was to do some paper piecing, not to be confused with paper piercing, two very different techniques. 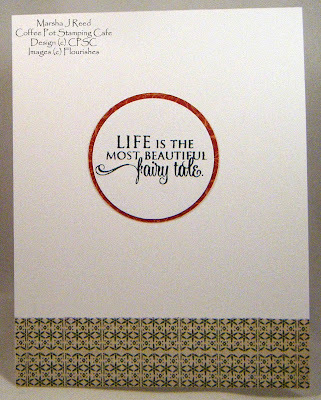 What's more, those who enter have a chance to become a Guest Designer for Flourishes. Now that would be beyond exciting! 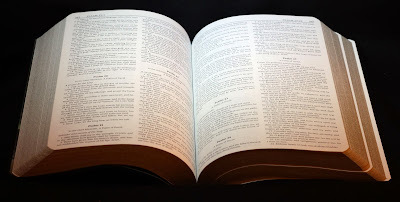 All you have to do is follow the challenge specifics to be considered. For my card, I used one of the images from the Garden Fairies stamp set. The main image was stamped on Classic White card stock using Tuxedo Black ink. I used colored pencils for the grass and flower stem. Each segment I paper pieced used a different patterned paper for the flower, the dress, the wings and the butterfly. 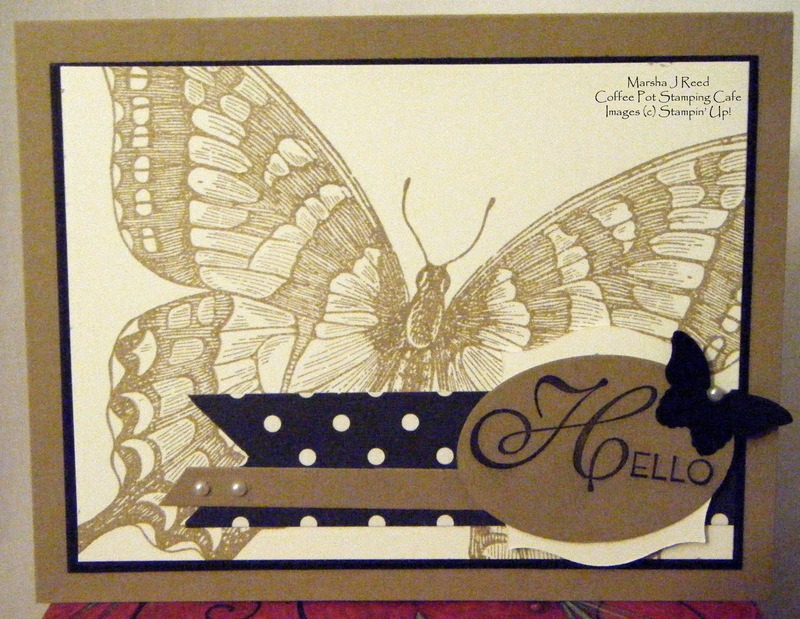 The image didn't stamp well on the silver glitter paper, so I used a black colored pencil to show the detail in her wings as well as on the butterfly. 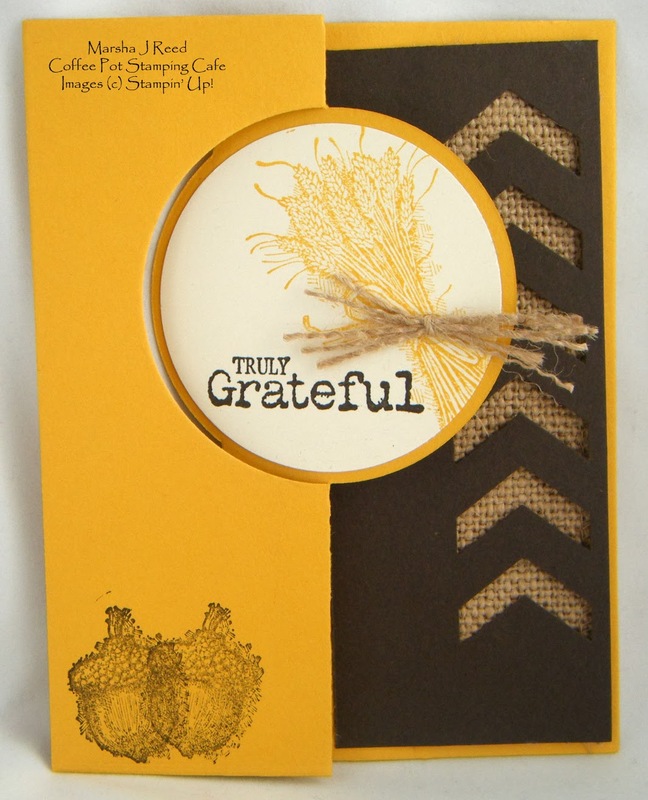 I added the sentiment to the inside of the card because I wanted the image to be the focal point of the card. If you want to more details about the challenge and special contest, click the image below. There is still time for you to join in the challenge. This stamp set is one of my favorites. I loved reading about fairies and fairy tales when I was a girl. 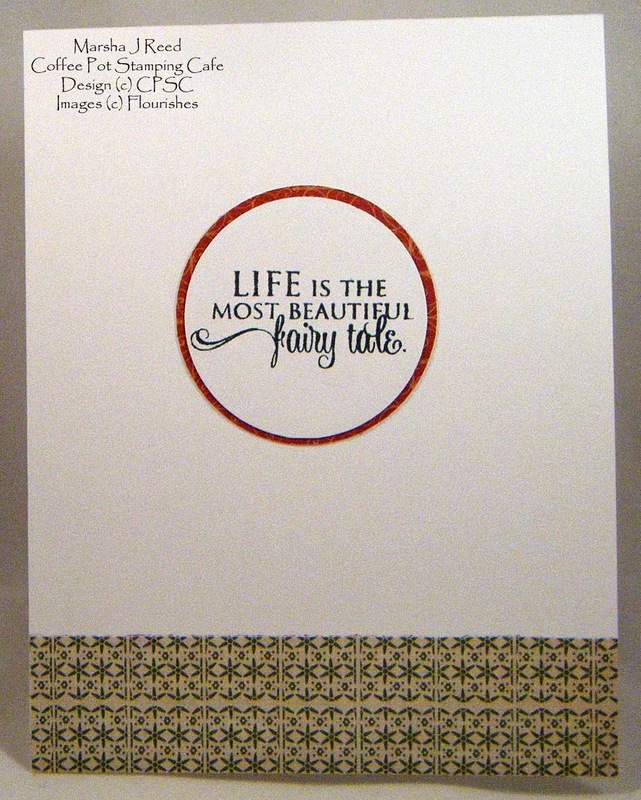 And, yes, I still believe in fairy tales! Today I'm playing along with a new, to me, challenge over at CAS-ual Fridays. 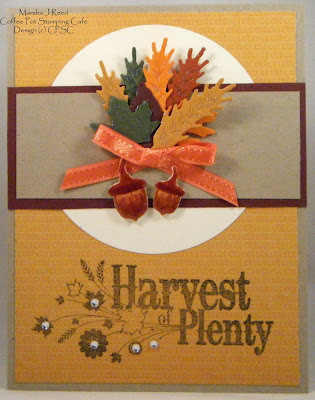 The challenge was to use a Fall color palette and at least one leaf in a clean and simple design. It also gave me the opportunity to use one of the cut files I have for my Silhouette SD. The leaves have now started to change here in Iowa. The trees out my front door are adding a touch of golden yellow to their branches. I think this weekend will be a good one to go check how much Fall color is out there. Another week or two and should be beautiful. 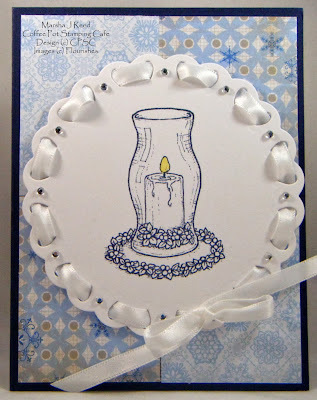 The Glimmer Mist is hard to see in the photo but it gave the whole card a very pretty shimmer. Now it's time for you to go check out all the other talented designers. Just click the image below to head over to CAS-ual Fridays. For me, it's time to go make some bows. I have my week all planned out and it's a busy one! You'll find me most days and evenings sitting at my craft table inking and stamping and cutting and gluing and just plain having fun. The Lord koweth how to deliver the godly out of temptations. 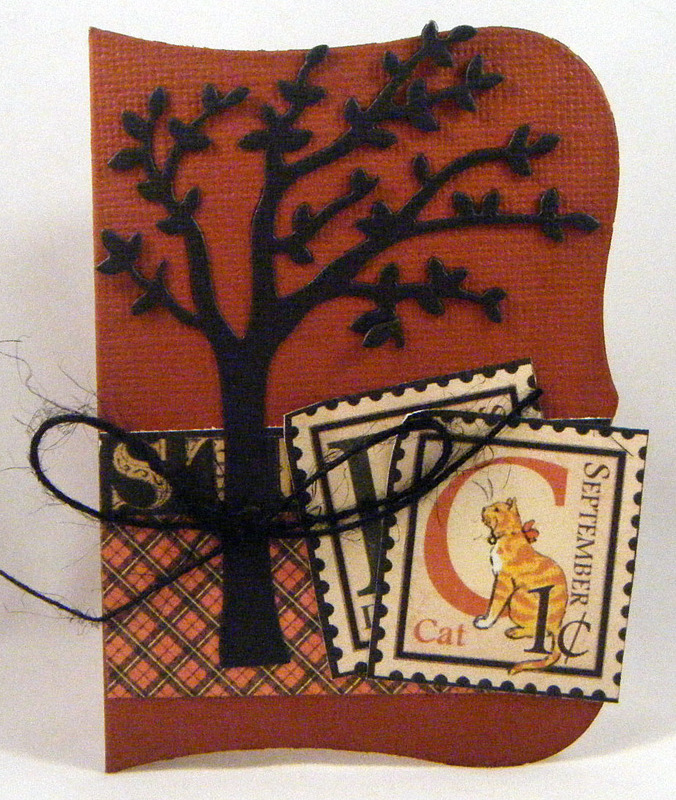 This is the final card in the Graphic 45 September A Place in Time card set. It is also my favorite one from the set. 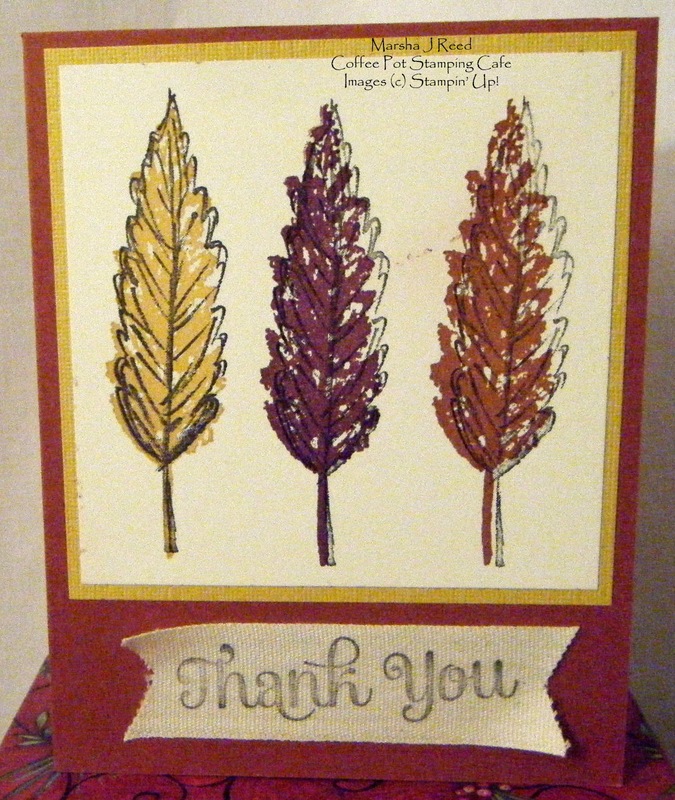 Sometimes it's nice to make a card that is not a traditional shape. Don't you just love that cute little tree? It's the Windy Tree Die from Taylored Expressions. It is definitely on my wishlist now. 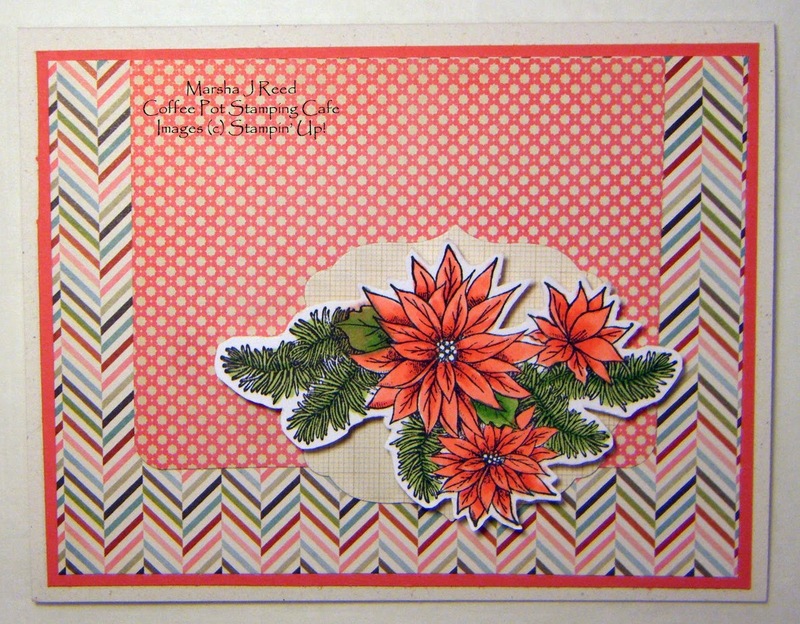 This was such a fun class and I love all the new cards I have to send out to family and friends.